As I write this, it is the Feast of the Epiphany. On this day, we celebrate the manifestation of Jesus Christ to all nations, to all peoples. God gave a sign — in the form of a star — showing that it is God’s desire for all people to know Jesus. Magi traveled at great difficulty over a great distance to offer homage to Christ Jesus, and then they left transformed. Every encounter with Jesus leads to transformation. In the assigned epistle for today from Ephesians, we read of what we could call Epiphany Work. …to bring to the Gentiles the news of the boundless riches of Christ, and to make everyone see what is the plan of the mystery hidden for ages in God who created all things; so that through the church the wisdom of God in its rich variety might now be made known to the rulers and authorities in the heavenly places. Did you catch that? Through the church, the wisdom of God in its rich variety is to be made known to rulers, authorities, and, presumably, all people. Are we doing that very well? I don’t think so, and if I’m talking more specifically about the Episcopal Church, the answer must surely be a resounding no. The draft churchwide budget for the Episcopal Church contains a staggering 41% cut to evangelism. I want to pause right there. In 2015, at our General Convention, in a groundswell that many felt was Spirit-led, we elected a Presiding Bishop who wanted to be known as a Chief Evangelism Officer. We passed resolutions that led to a churchwide evangelism conference (and another one is on the way, register now! ), the first one in recent memory. We amended the budget from the legislative floor to invest more money in evangelism. The Spirit was surely doing something in our church. And it’s the right moment. Christendom has fallen to dust (thanks be to God). Many, if not most, Episcopal congregations report that they are in financial distress. We continue to post annual declines in attendance. But institutional turnaround is not the reason I believe now is the moment for evangelism. Our world desperately needs to hear a word of hope, the Good News of God in Jesus Christ. In the tempestuous swirl of constant chaos, we need to insist on space for the still, small voice of God to be heard. In the face of growing economic disparity, we need to proclaim God’s abundance, justice, and righteousness. In a culture of fear-mongering, we need to echo our Savior and the whole of the scriptural witness: be not afraid. In a post-truth age, we need to invite people to know Jesus Christ, who is the way, the truth, and the life. Every sign points to the fact that people are ready to answer this invitation, especially from Episcopalians. I’d be delighted if seekers found their way to any church, but since I’m head-over-heels in love with the Episcopal Church, I’m going to talk about my own people here. Our combination of ancient liturgical practice and modern engagement with issues is exactly what many people are seeking. Congregations which have focused on discipleship, including the practice of sharing our faith, have flourished. When we have begun church plants, we have a better-than-expected success rate. There is a growing wave of Episcopalians diving into the scriptures, and when people do that transformation is the almost-inevitable result. Research from Forward Movement’s RenewalWorks ministry shows that scripture engagement is one of the most important catalysts for spiritual growth. Other important catalysts include participation in Holy Eucharist, daily habits of prayer, and serving the poor. Where people are focused these basic things, spiritual growth and measurable congregational growth is happening. Once people grow spiritually, they are more able to talk about their faith. And thus we are laying the necessary foundation for effective evangelism. So we have the foundation for evangelism. We are the right kind of church at the right moment. And we have seen success with church plants and other new ministries. Why are we talking about cutting evangelism in our churchwide budget by almost half? Good question. Reasons will vary. Many people have given up on evangelism, and they accept decline as inevitable. This goes hand-in-hand with a failure to see the world’s need to know Jesus Christ as Lord and Savior. For some people, the apparent mission of the church is merely to exist, to serve the needs of its members. But the mission of the church is “to restore all people to unity with God and each other in Christ.” And “the Church pursues its mission as it prays and worships, proclaims the Gospel, and promotes justice, peace, and love.” Proclaiming the Gospel is central to our mission. Just about all institutions are resistant to change, and the Episcopal Church is no exception. In such a system, those who push for change will often meet fierce pushback. So it is with evangelism funding. Quite a few people in the inside circle of our church were considerably annoyed when the budget was amended to provide more money for evangelism. We’ve never done it that way. And so, in that view, returning evangelism to “normal” levels is essential. But now is not normal, or maybe I should say there is a new normal. There is (understandable) skepticism of churchwide programs. The Decade of Evangelism was not a resounding success, for example. So there are folks who do not want us to spend more money on evangelism, which they fear would be wasted. I understand where they are coming from. I believe this is a different time, and we have different leaders operating in a different context. But beyond that, the alternative to doing something is not doing something. And we know what that path looks like. It’s not a good future for our beloved church and its ability to draw more people into a life transformed by Jesus Christ. Have a good look at the full draft budget and some notes about it from the budget committee. In a post tomorrow or the next day, I hope to have more to say about the budget. But for now, just a few notes. While evangelism is cut 41%, governance spending is increased 38%. While evangelism spending is proposed at $3.5 million over three years, spending on finance and legal is proposed at $40.5 million over three years. If we spent the same $6.0 million on evangelism we budgeted last triennium (that is, without massive cuts), we’d be spending 4.5% of our budget on evangelism. Can someone tell me how we can’t afford 4.5% of our budget doing what is perhaps the most important thing Christians do? Here’s the deal. We haven’t done a good job with evangelism for most of our church’s history. We know that. We can either accept that as our future, or we can try to change it. I believe it’s changeable, and we’ve seen early evidence of a new way. We have new leaders, and it is a new day. Frank Logue has written about how we invested in starting new ministries, and how those ministries are bearing fruit. We have created networks to link those doing church plants and other new ministries. But if the cuts persist, that work will be curtailed. For the sake of the status quo, the budget proposal ends work that is thriving. Jared Cramer shares the video story of one new ministry, El Corazón Latino Ministry Initiative at St. John’s Episcopal, Grand Haven, MI. Everett Lees looks at Jesus’ teaching, “Where your treasure is, there your heart will be also” and says we might need to change our hearts with a different budget. I know, anecdotally from my travels, that Episcopalians are finally figuring out why evangelism matters. They are understanding that we can do this. And they are seeing transformed lives as a result, and that leads to growing congregations. The committee that is working on the budget seeks your input. Please visit the site and share your thoughts on the draft budget. If you agree that we need to keep our evangelism spending steady, if not increase it, say so. You have until January 10 to weigh in with comments. If you have a blog, write something. If you are on social media, say something. Once this draft is revised, Executive Council will revise the budget and hand it off to the Program, Budget, and Finance committee, and then it will be adopted at General Convention. So there is still plenty of time to tweak and change the budget. But this particular line item is an important one to fix early on, because those of us to want to see transformation need to speak as loudly as all those who seek the status quo. As you are pondering the budget, I have some suggested reading. Whether you are a voting deputy or bishop, or someone outside the legislative system who loves the church, let the scriptures guide your approach to our budget. After your ponder, make sure to share your thoughts. The Gospel asks much of us, and there is little in the scriptures that would argue for safety and caution. Let us be bold, for the sake of our church, but more importantly for the sake of the Gospel of Jesus Christ. The magi didn’t travel across the desert to admire governance and institutional stability. They traveled to pay homage to Jesus Christ, whom God desires all the world to know. Let’s do our part, shall we? Let’s invest in introducing people to Jesus Christ. 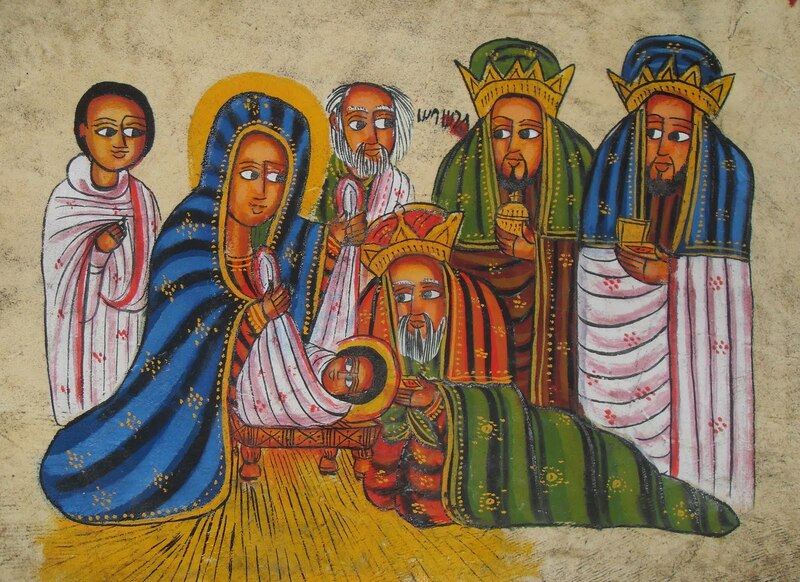 Photograph: Magi in Ethiopian style. Photograph by Patrick Comerford. Note: Though Forward Movement, my employer, considers evangelism at the heart of our mission, Forward Movement does not receive any money in the General Convention budget. I write this independently, as a deputy and concerned Episcopalian. “Our combination of ancient liturgical practice and modern engagement with issues is exactly what many people are seeking” is right on target, and timely. My late husband evaluated businesses for a living. It was his belief that a 5% budget line showed a lack of commitment. If an organization was committed to a course of action it devoted more than 5% to that activity. Is the Episcopal Church committed to evangelism? Draw your own conclusions. In the draft budget, evangelism is closer to 2%. I don’t think your late husband would believe we are very committed to this. I know the decline in religiosity in general can be discouraging and seemingly indicative that there’s no point in putting resources into speaking to a population that doesn’t want to hear you, or may even explicitly *hate* you, but I also agree with you that the Episcopal Church is “the right kind of church at the right moment” and “Our combination of ancient liturgical practice and modern engagement with issues is exactly what many people are seeking” because that is exactly what I’ve been seeking. I found the Church through sheer luck, and if I hadn’t remembered it existed recently during a period of questioning, I’d probably be a rather bitter and unfulfilled person right now. I think if more people actually knew we existed and what we actually believe in, there is a chance for the trend to change. Hello. I am a new Episcopalian and Christian. I was baptized in June 2017. My catechumen teacher posted a link to this essay to Facebook. I don’t really know anything about budget or governance or anything. But to be honest, I feel hurt when people say that evangelism isn’t working. What about me? I guess I’m not considered much of an asset. Luckily, my parish taught me the incredible truth that even as just one measly person, I am a beloved child of God. It also turns out almost everything I thought I knew about Christianity was wrong. It’s about forgiveness, not about condemnation. It’s about reaching out to those on the margins, not building walls. It’s a daily spiritual practice based on love, using tools like the Book of Common Prayer. As a former non-Christian, I can confidently tell you that people have no idea what the Episcopal Church offers. But there are a lot of people who need to hear its message.